Saturday was the last day of the conference, with thoughts of the trip home creeping in between the continuing activities. On the way to my appointment with an agent, I stopped at the concierge desk to ask about airport shuttles, and the helpful young man who made a reservation for me also told me how much the hotel was enjoying our conference. I suspect we left very little destruction in our wake. After my appointment, I was once more drawn as if by a giant magnet through the Goody Room, where I managed to pick up two more free books. The tables of promotional giveaways adjoined a new feature of the conference, the Connect Lounge, a spread of round tables equipped with WiFi stations, evidently quite a success. Whenever I went by the room was full of people chatting and using their computers. On to a workshop presented by Sharon Sala, one of the nicest women I’ve met through RWA. Her topic, When One Door Closes, was meant for published authors who’ve hit a road block or two, been orphaned when an editor moved on, had an agent retire or a publisher go broke. I’m still waiting for that first door to open, but Sharon’s advice, starting with “never put all your eggs in one basket,” applies throughout a career. Sharon writes for Mira Books, but she’s also ventured into indie publishing this year with A Field of Poppies (which I’ve just added to my ever-growing Kindle library). On to another workshop, SOS for Writers, presented by Erin Quin, who discussed the mechanics of tracking and planning scenes. By this time my head was positively swimming with good ideas and information, but I have to confess the individual workshops had begun to run together. I’m looking forward to listening to them again on the conference recordings. After the rehearsal for the awards ceremony (we all walked across the stage and promounced our names into the microphone), I managed to fit in one last wrokshop, one I had been particularly looking forward to, From Aether to Zeppelin: Writing the Steampunk Romance, presented by Suzanne Lazear, Theresa Meyers, and Cindy Holby, three of the ladies of STEAMED, a blog I have been following for a while now. I’m not planning to write a Steampunk novel myself, not just now, anyway, but I’m fascinated by the ideas and the alternate world environment. On the way back to my room with a roast beef sandwich and a bottled frappucino from Starbuck’s, I stopped to print out my boarding pass on the courtesy computer in the lobby. Then I spent some quiet time reading on the patio between my room and the pool. About 6:30, dressed for the Big Party, I met the rest of the West Houston delegation in the lobby bar. Rita nominees Vicky Dreiling, Deeanne Gist, and Linda Warren joined us, along with Karen Burns, Julie Pitzel, Lark Howard, and Sarah Andre. Sarah, a Golden Heart finalist last year, was my “date” for the awards ceremony, where we sat up front at the VIP tables. The ceremony was great fun, with clips from all our favorite romance movies, funny presenters and even funnier acceptance speeches, and two standing ovations for Lifetime Achievement honoree Brenda Jackson. 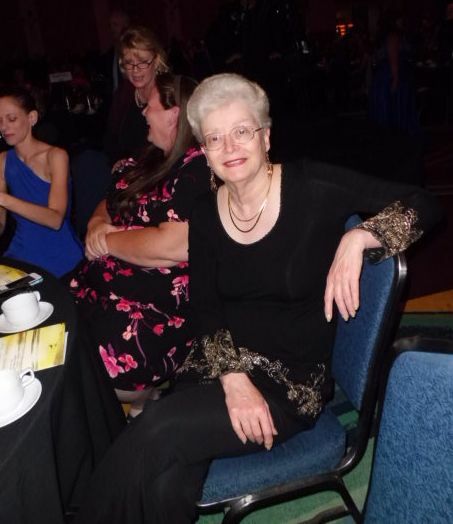 My Golden Heart category, Paranormal Romance, was first on the list, so as soon as that was awarded to my tablemate and friend Lorenda Christensen, I could relax and enjoy the show. (You can see the complete list HERE.) No one from West Houston won this year, but we all felt like winners. After the awards ceremony, the Firebirds gathered one last time at the First Annual AfterParty thrown by Samhain Publishing for all the Rita and Golden Heart finalists and their guests. Wine, cheese, fruit, desserts, and loud rock music–how better to end the 2012 Romance Writers of America® Conference? I’m not planning to attend the 2013 Conference next July in Atlanta. Unless, of course, I have a Really Good Reason to go. Thanks for catching me up on the conference. I hope you have a Really Good Reason to Go to Atlanta! BTW, your picture is pretty. What a great party they threw for you! Kay, your conference series gave me “I was there” tingles. Thanks for the vicarious thrill. I’m glad you enjoyed it. My head was swimming by Sunday–I had to look at my journal to remember what workshops I went to, and what they were about. I’m looking forward to listening to them all again–really glad I ordered the recordings.